Make Easy & Quick Instant Pot Broccoli with perfect texture every time! 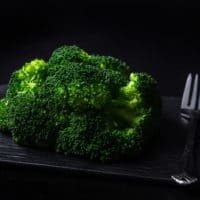 Cooking steamed broccoli in Instant Pot helps preserve nutrients for this deliciously healthy side dish. Pressure Cook Broccoli in Instant Pot: Pour ½ cup (125ml) cold water in Instant Pot. Place Steamer Basket in Instant Pot, then layer broccoli florets on it. Serve Instant Pot Broccoli: Remove broccoli immediately to prevent overcooking. Season with salt & black pepper if desired, then serve! Quick Release: To prevent overcooking, it's critical to release pressure immediately when broccoli is done pressure cooking.